Just had an extended week that's hard to reconcile. It seems appropriate to commemorate some of it before it permanently evaporates from my fleeting mental logs. Saturday, March 23: Atty, Kelsea and myself met to climb at the Solar Cave, Diablo Canyon, Santa Fe County. I finally sent the project that has been tantalizing me since last fall, then had enough left in the tank to cruise the project that was my first 5.12c a few years ago. It was an auspicious start to spring break. 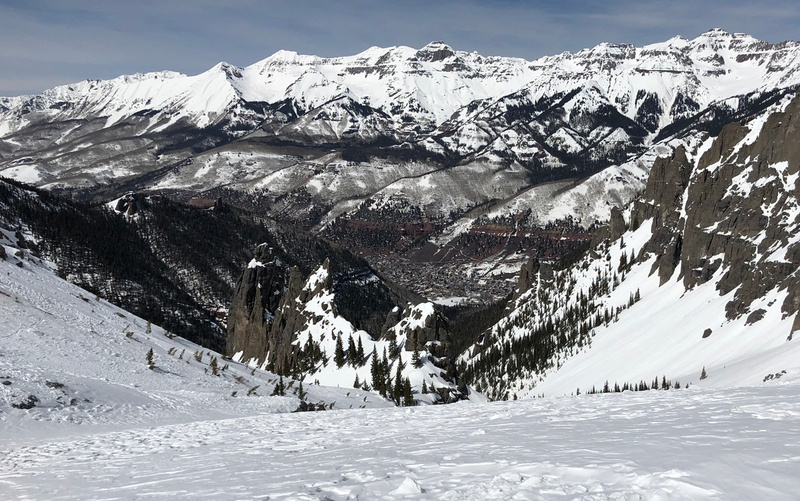 Sunday, March 24: It was a very pleasant six-hour drive from Santa Fe to Telluride. The scenery in the San Juans in general and San Miguel County in particular is spectacular. Hello Wilson Peak! Monday, March 25: The forecast is perfect, but it looks like weather potentially coming the rest of the week. My natural instincts tell me to get out there. 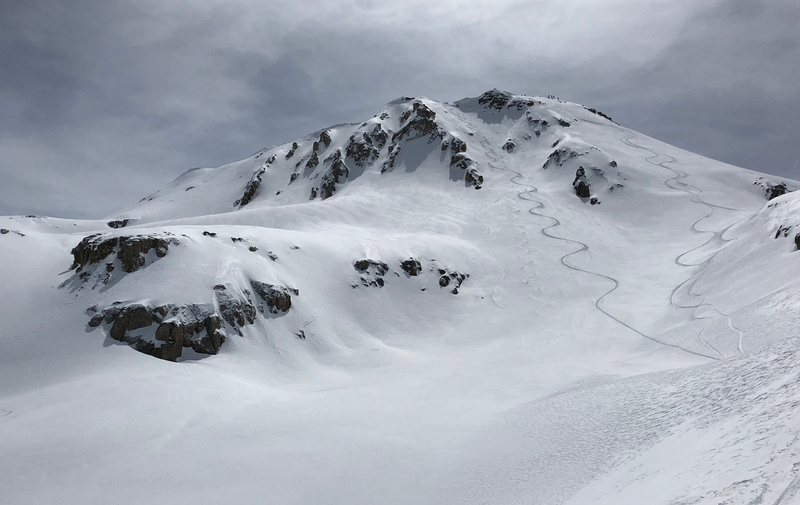 The Epic Pass worked its magic and it didn't take long to find the Revelation lift, which leads to backcountry access that is truly revelatory. Even without knowing the way, it wasn't hard to decipher and there were skiers actively breaking trail in that direction. 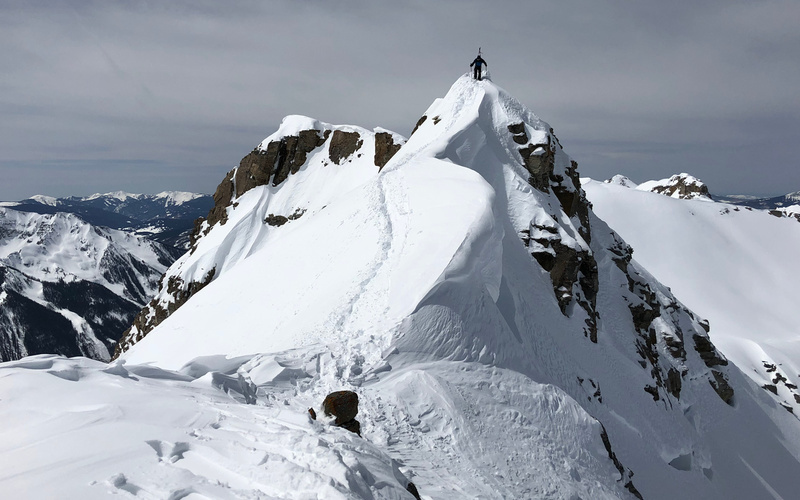 It didn't take much more than an hour to traverse and skin to the top of the San Joaquin Couloir. Now, overstoke was a factor. This type of skiing has not been part of my routine recently. Conditions weren't as favorable as when Ryan, Sam and I skied it in 2011. My legs weren't ready but I made it down the couloir in one piece. 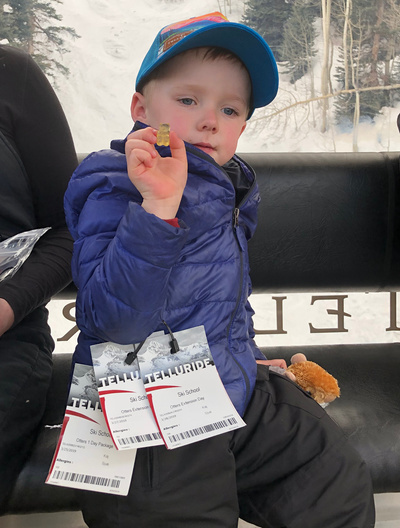 After a stop at the condo to check on the family, there was still plenty of time to ski another run and look into registering Kaj for ski school in Mountain Village. Kaj demanded to ski. That evening we took both boys to the base of the gondola and I carried Kaj up the snow so he could ski. 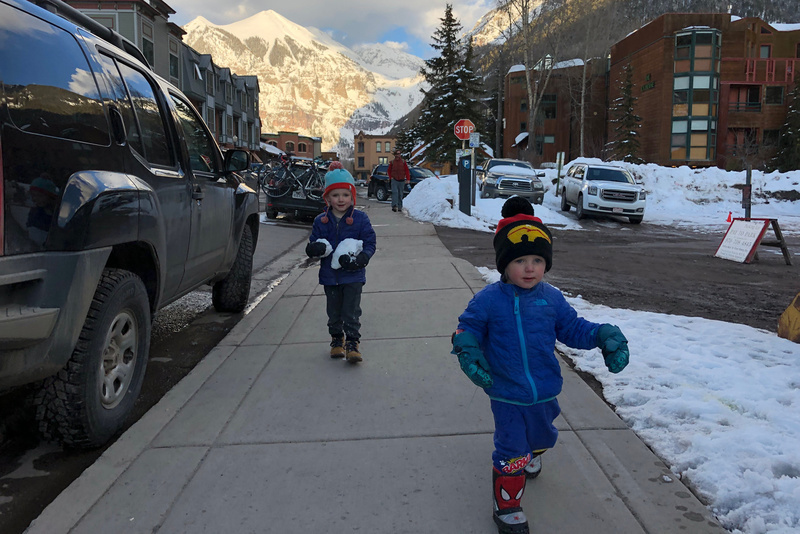 Tuesday, March 26: The next morning the ski school people checked and he needed bigger boots, so we got him rental equipment. Once he was safely in ski school the weather was still perfect, so it was time for some more backcountry fun. 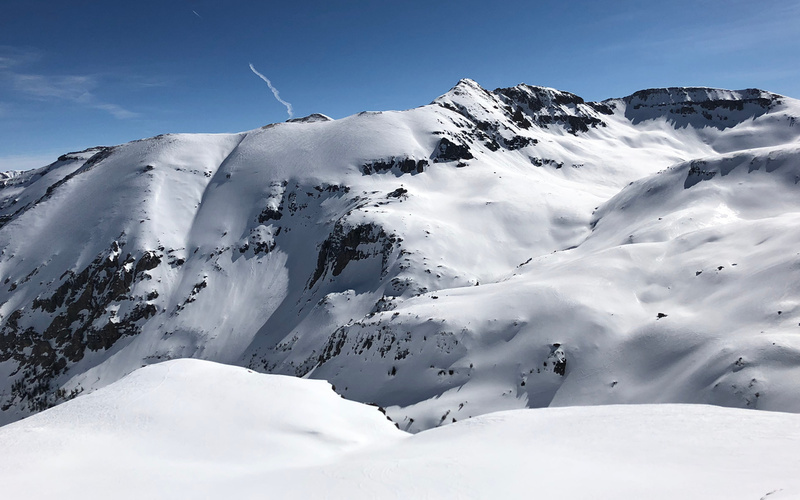 There was a local party of 8 or 10 at the apron of the San Joaquin Couloir. Before they were all ready I was on my way. This peak seemed like the obvious choice; several locals called it T12 unless I misunderstood. However, on Google's maps there is a peak about 1 mile to the ESE that is labelled T12, so it's confusing. 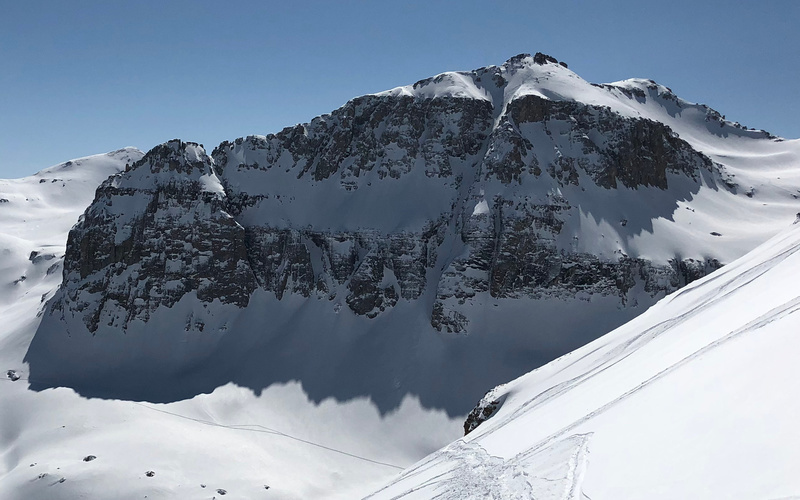 Two snowboarders were switching to descent mode below the summit ridge. This was meant to be a compliment, "Nice skin track for a snowboarder!" "I don't know if I should take that as a compliment or an insult." Hey, that was supposed to be a compliment. 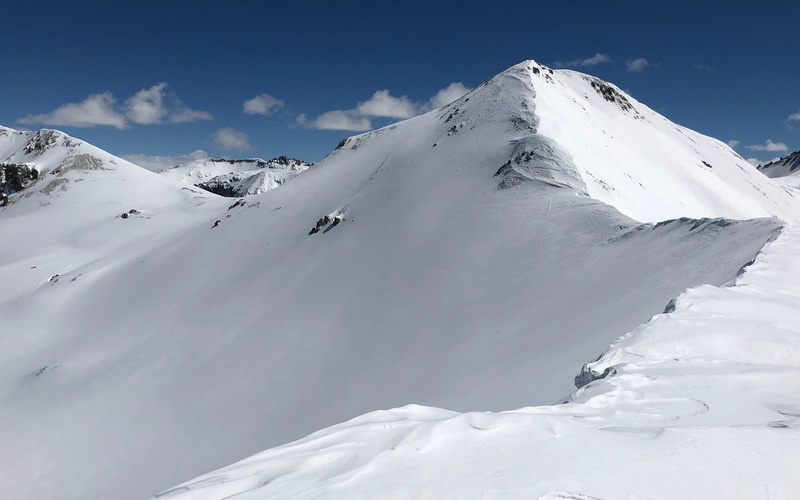 The summit ridge had some fun scrambling and a narrow traverse to get to the most obvious ski slope. This was interesting; an ice ax might have been nice. It wasn't clear whether the big group would come to the top. It was too good of a photo opportunity to resist when the first one crossed the traverse. This fellow from Ophir seemed nice. The descent off this peak to the south to Ophir of 3600+ ft looks very nice. Well, eventually they were all coming to the top and I was ready to go. It might have been pleasant to watch them all ski the alpine refill pow, but I couldn't help myself. Snowboarder tracks on the right. Lots of locals on the summit. Alisson had done some valuable coaxing to keep Kaj in ski school his first day. He insisted that he wanted to go the next day at the end of the day. 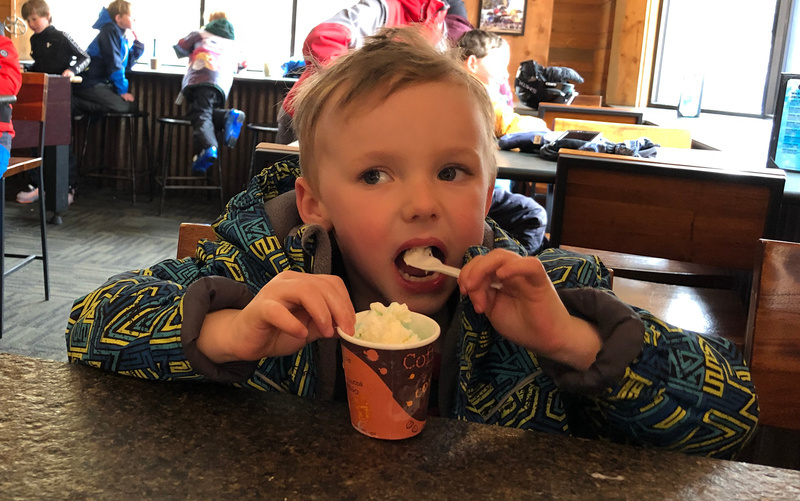 Wednesday, March 27: However, the next morning, the first thing he says is, "I don't want to go to ski school today!" Well, she artfully convinced him to go again. Then we did some skiing together. 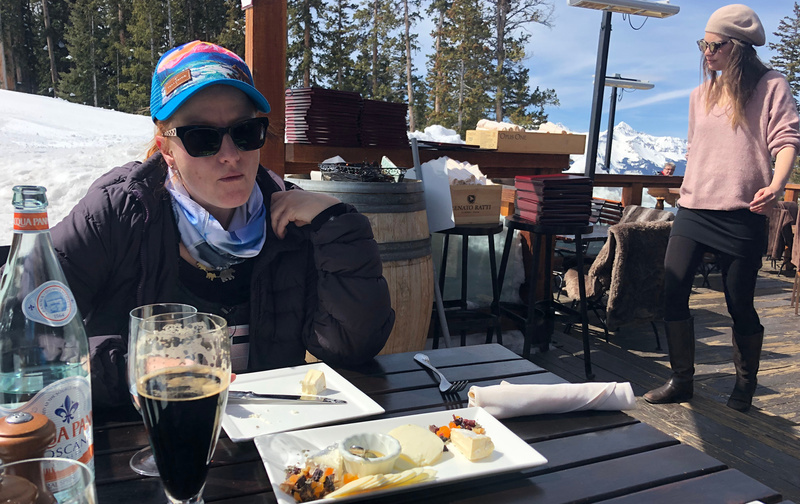 We stopped for a late morning break at Alpino Vino, 11,966 ft, perhaps the highest restaurant on the continent? It wasn't really our cup of tea, but we still had a nice time. At the end of the day, Kaj insisted that he would be going to ski school again for a third consecutive day. We had a fun family ski down Meadows. The next morning, he did require some coaxing again but maybe not quite as much. Thursday, March 28: It looked like perhaps the last day of good weather: imperative to ski something. This is the view of Little Wasatch from the bottom of the Revelation lift. 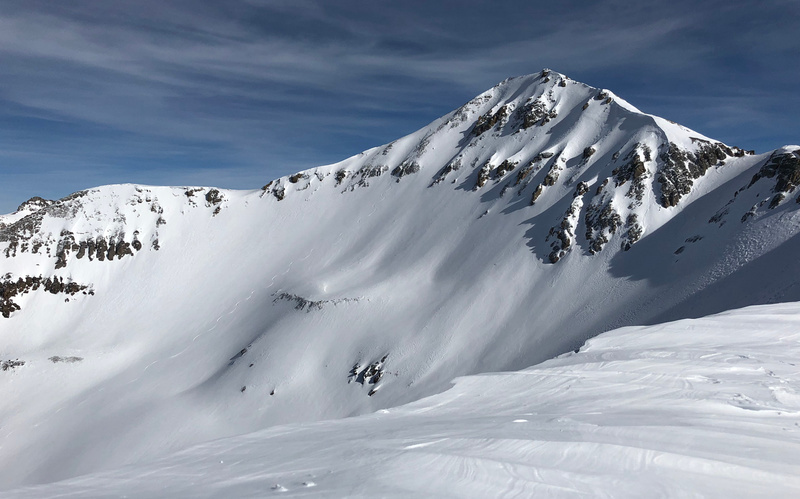 Just up the ridge from Little Wasatch is Wasatch Mountain, at over 13,500 ft the highest peak in the immedate vicinity. There were plenty of tracks on Little Wasatch but none seemed to go to or from the summit of Wasatch Moutain. It seemed like a good thing to ski. There were some skiers on the San Joaquin apron but they were heading elsewhere. It took about two hours to get from the lift to the summit. The north face was hard to resist: it looked like it held some powder. So let's do it. The true summit is on the left and looks slightly lower. 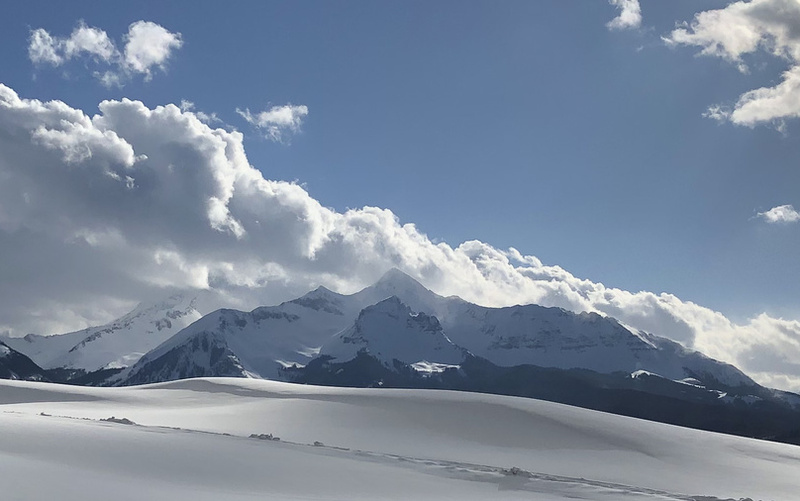 Skiing directly from the summit, a little bulge of slabby snow a few turns down measured 47 degrees. The snow was perfect punchy powder. Heading into the chute between the rocks where the snow looks smoother, it felt a bit too slabby for my taste. 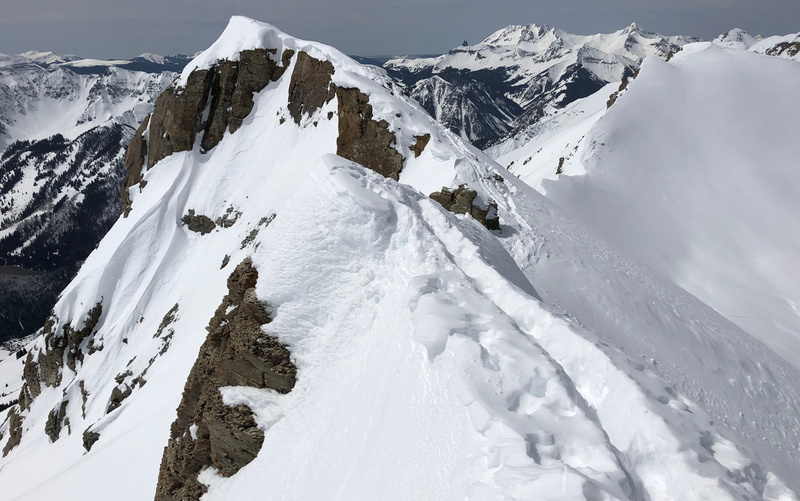 So I hugged the rocks and traversed through the thin part of the rocks to the lower chute on looker's left/skier's right. It wasn't any better so I kept skiing right on the edge of the rocks with the intention of skiing onto rocks if a slab popped. Below the choke, it seemed like everything should be fine so I let it rip in delightful recycled alpine powder. Then I got greedy. It looked like a direct descent nearly 5,000 vf all the way to Telluride was in the cards. However, the snow in the cliffy areas where the forest began was too close to isothermal and the correct route was difficult to decipher. Luckily, there was cell service so I called Alisson to ask her to get Kaj from ski school. After that, it was a 2,500 ft climb to Little Wasatch. View from about 1,000 ft above my low point. 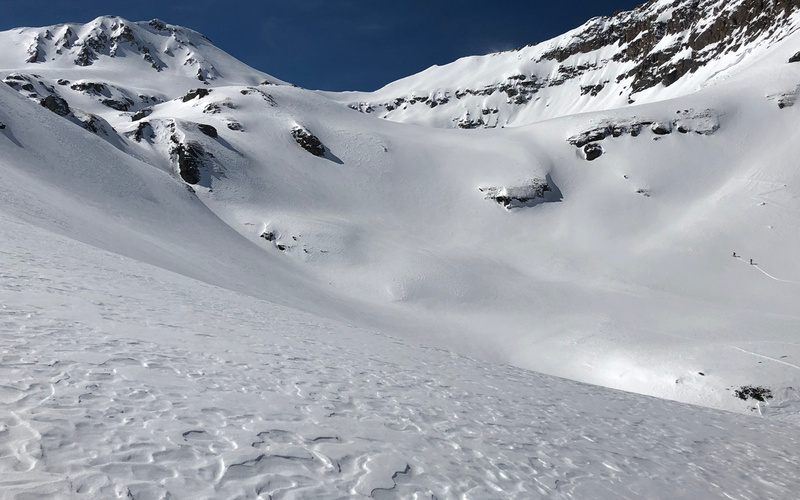 In retrospect it would have been possible to ski the gully directly from where I was, but this was not clear while scoping it from above. The bonus is that the 5 pm descent from Little Wasatch let me ski Corner Pocket in prime corn conditions. That's some very high quality skiing. 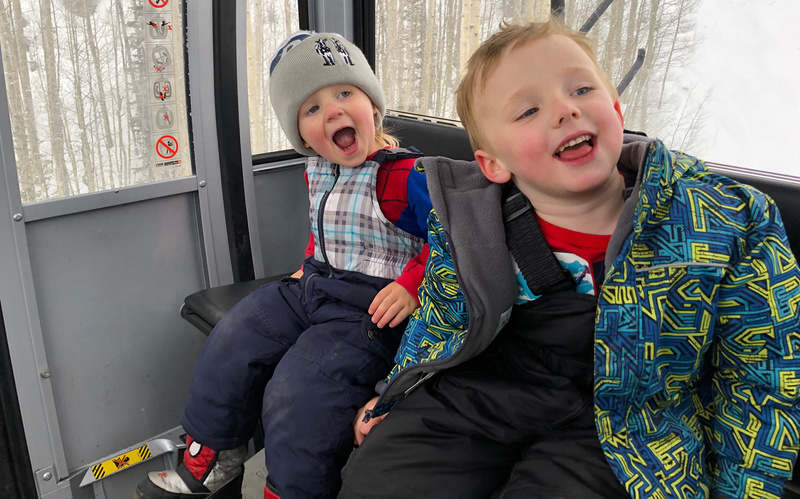 Friday, March 29: It snowed so I took Kaj to ski school and cruised around the mountain. 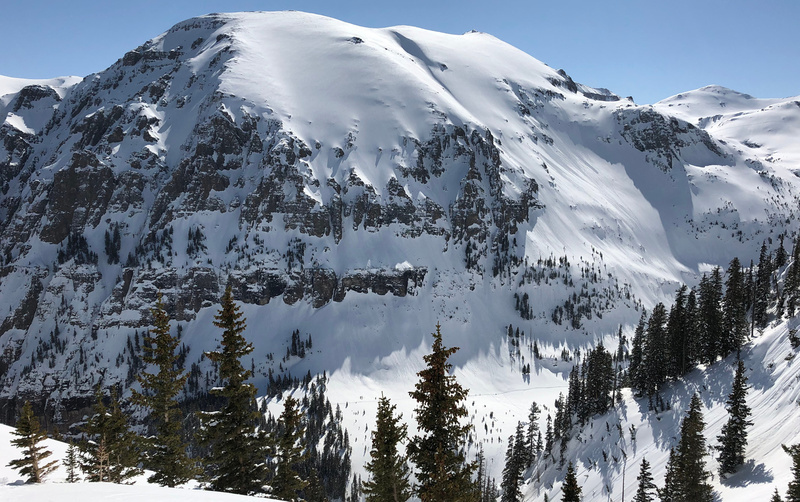 Saturday, March 30: Another good weather day, so Kaj went to ski school then I skied the most prominent remaining high point in the basin above Bear Creek. Correction: Silver Mountain is the most prominent thing after Wasatch Mountain. Next time! Five days of ski school and you skied Lift 10? Yes, you can have ice cream and finish your brother's portion as well! GONDOLA!? Boys, stop making those faces; you're hurting your mother. Pretty pics! Looks like a fantastic week full of fine lines and cherubs. Overstoke is a real phenomenon, and can afflict even the more mature among us. Next spring break hope to join you for the sequel. Almost always sunny? There were a couple cloudy snow days during our week there. 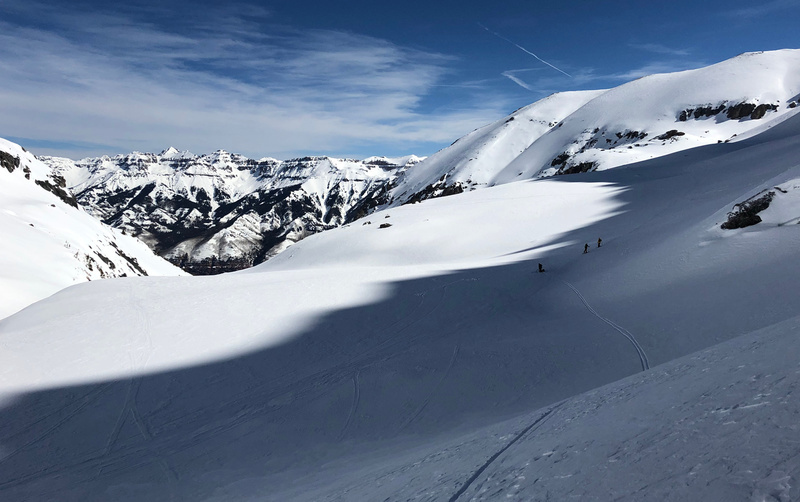 Also, much praise to the Telluride ski school folks. The next weekend Kaj skied from the top of Ski Santa Fe with me. He hasn't even started kindergarten and I can ride lifts with him now, so ecstatic.